Helen Henson has been fighting the last four years for her mother’s return home, she said. 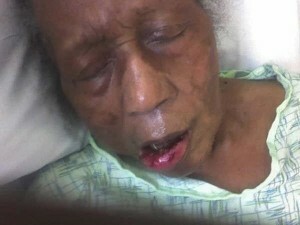 This year, January 31 was the last straw for Helen Henson Jr. That day her namesake- her 90-year-old mother Helen Henson Sr. was admitted to Little Company of Mary’s emergency room in Torrance with a fat, bloody lip and a large bruise on her leg. Employees at the Royalwood nursing home, also in Torrance, told her the injuries were a reaction to antibiotics given to her mother for a bladder infection. Henson Jr. said she has been trying to get her mother back home with her since 2003 after a mental health court decided that the elderly woman needed to be under the guidance of a public conservator. During that time her father had passed and mother went into a deep depression, she said. Often, she would have to take Henson Sr. to emergency for episodes stemming from her mental condition. “From there (emergency room) they observed her and that’s when all the confusion started. It happened October 28, 2003. There was an LPS (Lanterman-Petris-Short (LPS) Act) hearing that I attended,” Henson Jr. explained. “During that hearing, the doctor was allowed to say under oath that I said I could no longer take care of my mother. I never said that. In that court building, I raised my hand. The bailiff told me to be quiet. It’s one of the best-kept secrets and one of the most terrible courts. When I was sitting in the courtroom, I did not know what the hearing was about. [After looking into it] I found that LPS is to put people on drugs. It’s to allow psychiatrists to put people on drugs… ” “After that doctor made that false statement, my mother was thrown into the hands of the Los Angeles Public Guardian conservators,” said Henson Jr.
“My mother was at Colonial Nursing Home in Long Beach first. At that time she wasn’t being given so many different drugs. She could walk on her own and she could talk. From there she went to Newport Beach, where I started noticing her change she was babbling a lot. From Newport she went to Clear View in Gardena. From Clear View she went to Royalwood. Henson said she had been continuously reporting what she saw to the Public Guardian via phone, email, fax and writing but was consistently ignored. In fact, she said the only reason she felt anyone called her on January 31 was because they could not get in touch with her mother’s guardian. “I called the police. Two officers from the Torrance Police Department were there. They saw it.